White-nose syndrome, first identified in the US in New York during the winter of 2006-2007 has killed millions of North American bats, and as of May 2016, has been confirmed in 29 states and 5 Canadian territories. 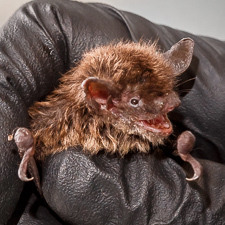 Threatened and endangered bat species alike are affected. In some locations, the little brown bat population is 10% of what it was before white-nose syndrome. To this end, the Service has set aside $32 million, a portion of which Dr. Chaturvedi has received to study the control of Pseudogymnoascus destructans, the causative agent of white-nose syndrome, with another fungus, Trichoderma polysporum. Dr. Chaturvedi has found a strain of T. polysporum that inhibits the growth of P. destructans with some degree of specificity, as a closely related fungal species is not affected. T. polysporum is capable of growing in the same cool environment as P. desctructans making it a potential weapon in the fight against white-nose syndrome.